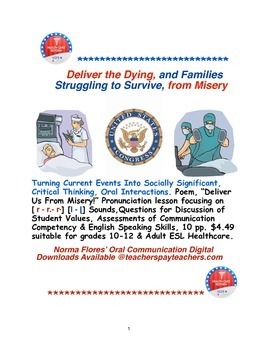 “Deliver the Dying, and Families Struggling to Survive, from Misery,” was written by Norma Landa Flores and is available @teacherspayteachers.com It is a 10 page lesson in developing Creative Writing and Public Speaking Skills for multicultural students in grades 10-12 and Adult ESL Healthcare. 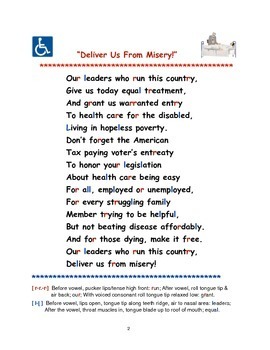 Page 2, features the Poem, “Deliver Us From Misery!” and makes a direct plea to our American Senators and Congressional Representatives to have compassion for the poverty stricken families of medically uninsured disabled and dying fellow Americans in the United States and abroad. Through dialogues, children of the USA reach the conclusion that they should provide input to the Nation’s Health Reform Policy by making it affordable for all, employed or unemployed and especially for the disabled and the dying. The poem focuses on developing articulation proficiency by contrasting [ r ] as in run [ r. ] as in our [ rˑ ] as in grant [ l ] as in leaders and [ ɭ ] as in equal consonants in the poem, with specific instructions on how to articulate the sounds, and can be very useful for Language Arts teachers working with ESL students at any grade level, or instructors teaching Creative Writing, Critical Thinking, Problem Solving and Oral Communication Skills. 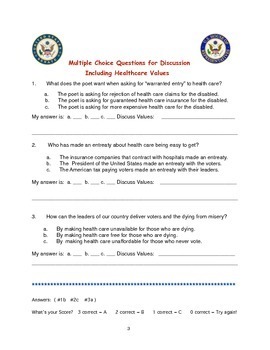 Page 3, consists of 3 Multiple Choice Questions for Discussion that encourage students to share their values and opinions from their own cultural points of view and explain how the questions are relevant to them or if they have any feelings about the topic. Page 4, features the Functional Articulation Assessment worksheet through which dyads meet to assess each others articulation competency of the target sounds. 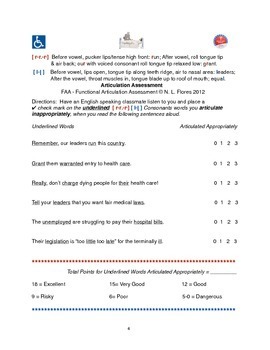 Page 5 is the Access,Assessment of Communication Competence and English speaking Skills form. Students read the sentences a second time and evaluate themselves on the observable communication behaviors of : eye contact, audibility, pronunciation, grammar, emphasis & communication of message function & intention. This poem is bound to receive lots of positive feedback from parents and community leaders due to the ongoing controversy of how our politicians, social agencies and community leaders can help solve the problem of how to meet the health care needs of the working poor, unemployed, disabled and dying members of our society, in a humane, sympathetic and compassionate manner. The lesson preserves our heritage of humaneness, sympathy and compassion for our ethnically diverse fellow Americans struggling to survive in today’s low income, fast-paced way of life.